When you decide to move, packing all your belongings is only half the battle. You have to figure out all the logistics and, most importantly, how much the move will cost. The experts at MovingAddresses.org have created a short guide to help you budget for your move and calculate all your potential expenses. There are many tools available that can help you organize your moving budget. The team at MovingAddresses.org recommends using a spreadsheet or an online resource that can simultaneously organize and calculate all of your expenses. It is easier to understand how much you’ll need to spend for each part of your move when everything is neatly laid out and organized. It is also much easier to see where you can cut costs to improve your budget. Deciding whether you will hire movers or move your belongings yourself is a major part of budgeting. You must consider distance, how many heavy items you own and what you can ultimately afford. If you are moving a few miles away, moving your items yourself is usually most cost effective. If you are moving to another state, the experts at MovingAddresses.org recommend you calculate traveling costs for both moving methods to determine which option is better for you. If you are moving large, delicate items like pianos or glass cabinets, investing in moving insurance can save you the cost of having to replace these belongings. When deciding which method to choose, be sure to lay out all your options in your organizational tool to see which option best suits your needs. Moving is expensive, and the further away you move, the more expensive it will become. There are many online travel calculators available to help you determine how much moving will cost you. If you hire a moving company, it will usually have its own moving calculator to help you determine the cost of particular services. If you are transporting your items yourself, you must consider the cost of gas, renting a moving truck or purchasing plane tickets if you are flying. Make sure to factor in all the possible expenses you may have along the way, and use the travel calculators to your advantage. If you decide to hire movers, be sure to read over all their guidelines to see if there are any hidden fees. Many moving companies may charge you extra for moving certain items, and others may require you to pack everything in boxes instead of bags. 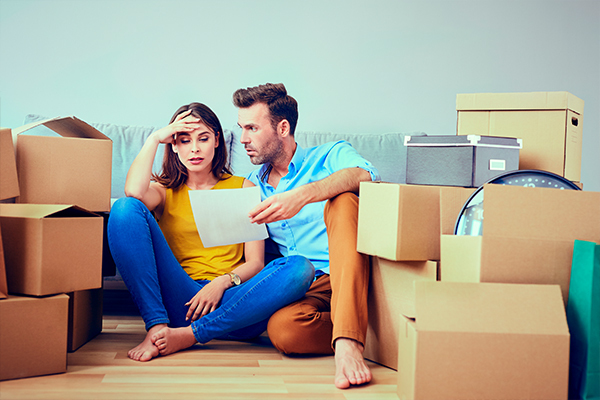 Some companies also have specific distance and travel fees that you may need to consider if you are moving out of state. Certain apartment complexes also have hidden moving fees, which you should take into consideration as you build your budget. The team at MovingAddresses.org suggests thoroughly reading all your moving documents to accurately calculate all of your moving fees. If your expenses look to be more than you can afford, try to go over all your costs and see if there is anything you can cut out. For example, you can reduce the amount of packing materials you need to purchase by using towels and clothes instead of bubble wrap to keep fragile items from breaking. You can also use laundry baskets, luggage, large bags and trunks instead of boxes to utilize the packing equipment you already have rather than buying more. Selling items you plan to leave behind or throw away is also a good way to help your budget. The team at MovingAddresses.org recommends cleaning out all the items you wish to sell a few months before moving to ensure you can use that money for your move. Simple money-saving solutions like these can help you fit exactly what you need into your budget and may even leave you with some extra money you can use in case of emergencies.